It's Computex week, when the great and good of the tech industry heads to Taipei to show off their stuff. And if there's one trend this year, it's been battling over tablets. First up was ARM, whose processor designs power many of the tablets on sale today. The firm has big plans: it wants to take its 10% share of the mobile market to 50% by 2015. As Kate Solomon reports, "Although no official Ultrabook products have been unveiled, Intel's executive vice president, Sean Maloney, reckons they 'will make up 40 per cent of the market by the end of 2012'." It's all thanks to the Ivy Bridge chipset, which is thinner, faster and more energy efficient. We should see the first Ultrabooks in time for Christmas, with Ivy Bridge turning up in computers in early 2012. Intel also has a new version of the Atom, the Oak Trail, which has been specifically engineered for tablets, delivering the performance for demanding apps while taking up less space and consuming less power. So things look to be breaking down into Intel and ARM bellowing "We will be the mobile king!" at one another. And, of course, Nvidia is part of it. We knew about its ARM-based quad-core Tegra 3, codenamed Kal-El, already, but Nvidia's Computex demos have been knocking people's socks off. Expect to see Tegra 3s in tablets later this year. Not to be outdone, AMD's been showing off its mobile tech too. AMD general manager Rick Bergman showed off a brand new Trinity APU, which is its term for a chip that combines CPU and GPU on the same silicon. Dual- and quad-core versions should turn up on tablets in early 2012. Did someone mention tablets? Computex has more tablets than a branch of Boots The Chemist. Among the more interesting models were Acer's Iconia M500 running MeeGo, which currently looks like the world's loneliest tablet operating system since co-parent Intel washed its hands of the whole thing. 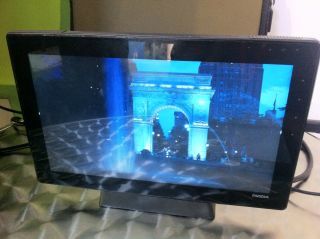 There's also the world's first seven-inch Honeycomb tablet, the Viewsonic ViewPad 7X. Last, but not least, there's the Padfone, Asus's bizarre and yet strangely attractive attempt to bring tablets and smartphones together. Like the Scarecrow in the Wizard of Oz, the Padfone doesn't have a brain: that's provided by the smartphone that lives in a secret compartment inside it. We are not making this up.